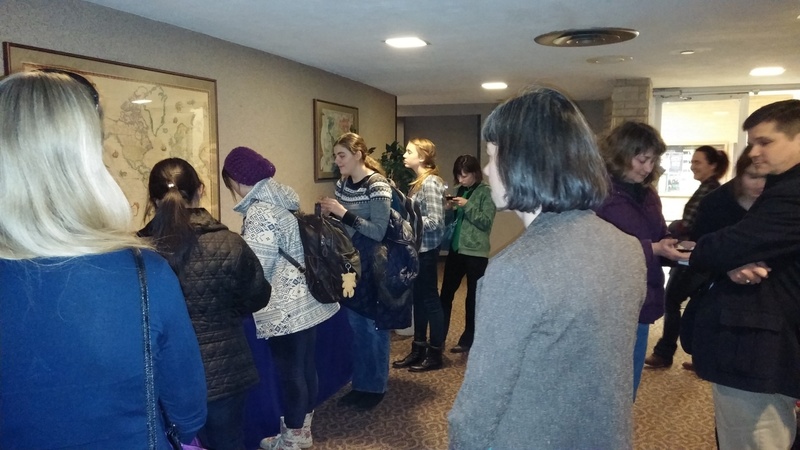 Students, faculty, and community members enjoy assorted French cheeses after the screening of Ernest & Celestine. In February and March of 2015, La Société Française, along with the French section of the Department of Modern Languages, hosted a festival of six French and Francophone films. This festival was part of the Tournées Festival of French Films on Campus, a nationwide festival of French films sponsored by the Cultural Services of the French Embassy in the US, the Centre National de la Cinématographie et de l’Image Animée, and the Franco-American Cultural Fund, as well as the Florence Gould Foundation, Campus France USA, Highbrow Entertainment, and the Franco-American Cultural Fund. The Festival was also made possible by generous support from campus and community partners including the Beach Museum of Art, and the Dorothy Bradford Pettis Fund. Students, faculty, and community members enjoyed six films: Ernest & Celestine (an animated movie about an unexpected friendship between a bear and a mouse), The Cave of Forgotten Dreams (a documentary about the prehistoric cave paintings in the Chauvet cave in France), The French Minister (a comedy based on a comic book about contemporary French politics), Mauvais Sang (a neo-noir drama), The Missing Picture (a documentary about the Khmer Rouge in Cambodia), and Farewell, My Queen (a historical drama about Marie Antoinette). For some screenings, audience members traveled over an hour to attend the festival. Film screenings were held in Eisenhower Hall, the Beach Museum of Art, and the Little Theater of the KSU Student Union. To animate the festival, professors introduced the films—teaching audience members key French terms related to the films, providing important historical and cultural context for the films, and explaining the style and movements films were associated with. Dr. Kathleen Antonioli in Modern Languages (French), Dr. Robert Clark in Modern Languages (French), Dr. Melinda Cro in Modern Languages (French) and Dr. Andrew Orr in History all presented films. After the first screening, the Department of Modern Languages hosted a French cheese tasting for audience members (very appropriate for a film about mice!). We hope to host French film festivals, open to the K-State family and the wider Kansas community, again in the future. If you are interested in learning more about the films and schedule for next year, you can contact Dr. Kathleen Antonioli (kantonioli@ksu.edu ) or check out our website https://www.facebook.com/KSUtournees.